More than $45 million has been awarded to Chick-fil-A team members. At Chick-fil-A, we pride ourselves not only on customer service, but also taking care of our own. Three decades ago, founder S. Truett Cathy set out to encourage Team Members to further their education by awarding scholarships to help pay for their college tuition. 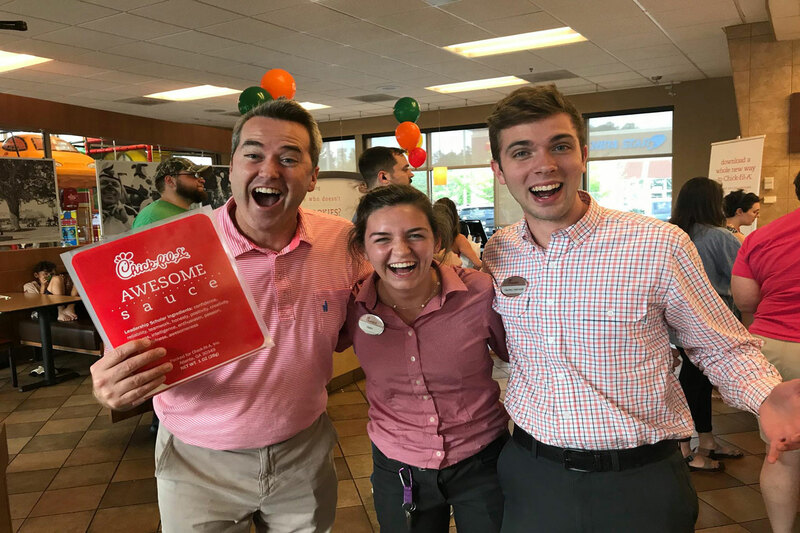 To date, more than $46 million has been awarded to Chick-fil-A restaurant Team Members who value leadership, educational success and giving back to their community. In 2017, Chick-fil-A further expanded its educational assistance initiative, called Remarkable Futures. Here’s what you need to know. What kinds of scholarships does Chick-fil-A offer? •	Leadership Scholarship: More than 3,000 students will receive a $2,500 scholarship with the ability to re-apply for up to four years. This amounts to a potential total of $10,000 for college while working at a Chick-fil-A restaurant. These scholarships are awarded to Team Members annually based on leadership, academic achievement and community involvement. •	True Inspiration Scholarship: Twelve Chick-fil-A Team Members will receive an individual, one-time based award of up to $25,000. These scholarships are based on leadership, academic achievement, community involvement and demonstrated financial need. In addition to scholarships, Chick-fil-A offers Team Members access to tuition discounts and other educational benefits at more than 85 colleges and universities across the country. These benefits can be combined with either of the above scholarships. Opportunities and eligibility vary by school, but can offer up to a 30 percent discount and is effective immediately. Applicants must be employed as a Chick-fil-A restaurant Team Member by a Chick-fil-A Franchisee, a Chick-fil-A, Inc.-operated restaurant, or an STC brand restaurant. Is there a minimum length-of-service requirement to be eligible for scholarship opportunities? There is not an hours-worked or other minimum length-of-service requirement for Chick-fil-A Team Members. If you are a Chick-fil-A Team Member, talk with your restaurant Operator or manager about eligibility requirements. The exact dates of the application window will vary each year, but it typically lasts from November to February. To view deadlines and guidelines, and to submit your application, visit https://cfa.scholarsapply.org/. If you are not a restaurant Team Member, contact your local Chick-fil-A restaurant to learn more about job opportunities. Where can the scholarships be used? Scholarships are awarded for all types of higher education, including vocational/technical school, undergraduate degrees and graduate degrees. Scholarship recipients also have the flexibility to apply the funds to an online institution. There is no length-of-service requirement associated with eligibility. Scholarships are awarded once a year. Recipients will be notified in the spring, and their funds will be sent to their educational institutions in the summer to offset the cost of tuition for the following academic year. Can team members receive the scholarship funds for more than one school year? Yes. Restaurant Team Members can apply for the Chick-fil-A Leadership Scholarship for each year of their academic career. Team Members can receive a potential total of up to $10,000 for college through the Chick-fil-A Leadership Scholarship, as long as they are serving as Chick-fil-A team member. The True Inspiration Scholarship is a one-time award. Eligible Team Members can earn up to a lifetime maximum of $25,000 in scholarships from Chick-fil-A, Inc. while serving as a Team Member. Check out our Frequently Asked Questions for more information on Remarkable Futures. Durante la búsqueda de una vida mejor, mucha gente dijeron a los gemelos idénticos Fernando e Ismael Fuentes que no podían lograr éxito en sus vidas.